To-day is the full moon day of the month of Vesakha which corresponds with the month of May. It is Wesak Day, the day The Buddha was born, attained enlightenment, and the day he passed away. To be contented and to live in peace with oneself, with the society and with nature. Today is also my birthday. This is my 60th year. I am now officially a Senior Citizen to be respected and cared for, or so it seems. The Chinese almanac has a 60-year cycle. So if I am not mistaken, next year my Chinese birthdate will correspond with my Gregorian birthdate. I think the Indians (Not Red Indians, but people of India. I need to say this because I noticed that many readers are from the USA) regard the 60th year as a new threshold in life. It is the beginning of the final stage in life. Sounds rather frightening. In very crude language, it is time to prepare to die. That is why the emphasis is to concentrate on the spiritual journey from now onwards. As for me, not a problem; as I have always been interested in spiritual matters. Many people have the wrong perception that if one is spiritually inclined, one must be a goody-two-shoes. It may be true. But consider another perspective: One is not so good; that's why one is trying very hard to be spiritual. I can consider myself to be one of the latter. I am not of good character; full of hatred, full of greed, full of foolishness, always impatient, always angry; I am what a good person is not! But knowing what I am, at least I try to cultivate the virtues of a pleasant person; or rather at least I try to reduce my negative traits as best I can. I must admit most times I failed, but then again I tried again and again. I shall do this till the day I die, even if I failed most times. At least I can die contented that I tried and tried. On a more positive note; it is said that knowing one's true self with all the faults, is half the battle won! Or to be on a more realistic mode; still losing half the battle! Hahahaha!!! From today onwards, a new day is a bonus day for me to be alive! I shall continue to "strive on with diligence." That was the final advice given by the Buddha before he passed away. I think you are just humble to describe yourself that way, to many of us, or at least to me, you are a wonderful person that I count myself lucky to have known you in virtual and real world. Put it this way, all of us are not perfect, and I guess, even Buddha himself doesn't regard himself a one perfect person. 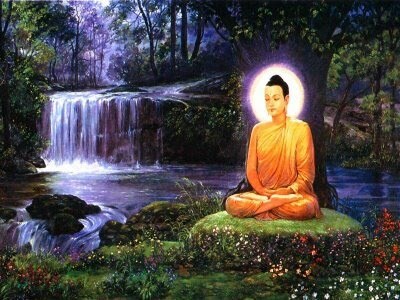 You are blessed to have your 60th birthday fall on Wesak Day, and it is an auspicious day. It is not a beginning to an end, but a beginning to a fuller life. Happy Wesak and a very blessed birthday to you. You have given me the best birthday present! You know deep down in my heart, after publishing this message, I did wish that you be the first to read it and write something to boost my Big Ego. There you are!! On another note, the Buddha was the Fully Enlightened One; which means he had no more flaws, the Perfect Fully Awakened One. On one occasion he was asked whether he was a deva (heavenly being), he said no. Then he told that person: "I am The Buddha, The Fully Enlightened One!" So your comment on the Buddha needs correction, Sorry. You are just lucky today to have your wish fulfilled to have me the first to comment and I am glad I can made you happy. Just came back from outing with my family. I was trying to find something that you want but I couldn't find it. Anyway, I shall try another day. Thanks for pointing to me the error I made on my comment on Buddha. I don't mean to belittle him in any way. He is an inspiration to me, to keep me on track. Happy birthday Justin. May there be many more to come. Guess what? I'm now more and more convinced that we shall see a change of government at federal level in our lifetime! There will definitely be a change in government in the next GE. I have great hope. I also hope that the Government keeps on harping on race, religion, Allah isue, and allowing racist bigots blaring out their hateful rubbish. The more they do that, more people will wake up to see the true picture. I have been a die hard supporter of DAP since I was able to vote and that was 40 years ago. Gerakan under Lim Chong Ewe was doing well until he betrayed the people of Penang by joining BN. From that day onwards, my mission was to kick Gerakan out of Penang. On many occasions I returned from KL to vote against Gerakan, even knowing the fact that my mission then was a lost cause. But I never gave up. The last election was in a way my "dream come true!! If ever Pakatan can rule Malaysia, and if ever they misbehave, I shall also likewise kick them out. Then I shall consider myself a true Malaysian citizen exercising my democratic rights. As I said before, great political parties like the Indian Congress, KMT in Taiwan, Suharto, Marcos, all could be toppled, what is so great and mighty about the little chickens like UMNO and BN component parties? Thanks to the old fox for sacking Anwar and presented him with a black eye. I think Anwar has learned his lesson the hard and painful way. That will make him a good PM. Don't accept the rubbish thrown on you. Gesang of "Bengawan Solo" fame, dies.